I’m planning another visit to New Orleans later in the year. So while it’s on my mind, a reblog of my last visit. “They told me to take a streetcar named Desire, and then transfer to one called Cemeteries and ride six blocks and get off at Elysian Fields.” Tennessee Williams. A Streetcar Named Desire. Scene 1. 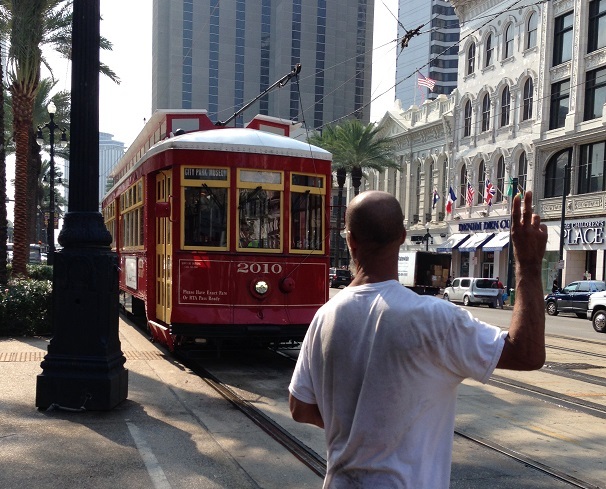 We were waiting on Canal Street, at the Royal Street stop, when the streetcar called Cemeteries came by. We wanted a streetcar named Museum, so we let Cemeteries go. But the next one was also Cemeteries, as was the next and the next and the next. Eventually, Mr. History Tourist asked the man sitting next to us, who had been there as long as we had, whether he was waiting for Museum. He wasn’t. He was waiting for his wife to cool down, so that he could go home. “Man, she’s so mad,” he said. “Let me buy you a cup of coffee,” said Mr. HT. Gallery | This entry was posted in Louisiana. Bookmark the permalink. I’d recommend it highly. I love it. Stuffed with great art, music and food, all wrapped in history. A tad smelly but it adds to the ambiance LOL. What’s not to love.